It has been 8 days since Thanksgiving, which of course, means we are 8 days into my favorite time of year - the Christmas season! Upon returning home Sunday, I got right to decorating the house. I finished up on Monday and have been enjoying our festive home all week long. I don't like to go overboard with the decorations usually selecting items that are in line with our style and go with the house. That being said, I do like things to feel special and will incorporate a little more whimsy into my decorating than I would otherwise. Below are a few of my holiday decorating tips. Above all remember to keep it simple. The holidays are all about traditions and that applies to holiday decorating as well. Over the years, I have slowly and selectively been collecting my Christmas decor. As I have said, I don't like too much so I want each piece to be something I really love and has meaning. Something that when I bring it out of the box brings back memories of holidays past. Each year, I like to build on my collection by either treating myself to something new or by taking on a little project. Last year, I created this simple holiday card display. It adds just a little something extra to our kitchen without being too fussy. This year, I am thinking about trying to make a pinecone garland. My Mom collected a whole bunch from our yard and I love how a garland of them looks over a mantle or arched doorway. 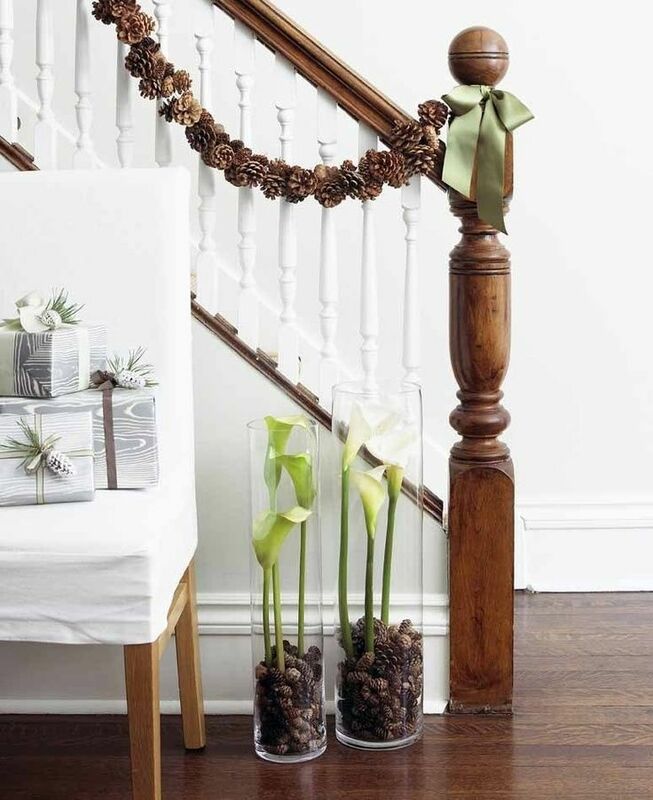 One reason, I like the idea of the pinecone garland so much is its a greenery element that will last year to year. Winter greenery, while not necessarily in line with point 1, is my favorite thing to decorate with around the holidays. It adds a freshness and warmth that just can't be matched and maybe the best part - its still appropriate after December 25th! I could easily spend a small fortune on wreaths, garland and swags so I have to control myself. This year, I am going to get a large wreath for over our fireplace. I also might indulge in garland for the staircase. I love the simplicity of this one. And yes, even though you will be cleaning up pine needles till May, I do think winter greenery should be real. Sorry no exceptions on this one. There is nothing quite like coming home to a house with lights. I am usually home before Jeff. But on the occasion that he has beat me to it, I love pulling in the driveway to see our christmas tree in the front window and our few lights on. We only have one back outdoor electrical outlet so I hang white stars in the front two french door windows and then have light up candles in the windows above. Its simple and symmetrical just how I like things. I also want to attempt an outlined lighted tree on a blank porch wall that is visible from the street. I hung one last year - which quickly fell down - so I am hoping I can come up with a more reliable means this year. I also really love some wintery outdoor pots. I usually just save the trimmings from our Christmas tree and plop them in our front pots. Super easy to do and requires no extra purchases. I am not usually a candle person but around Christmas and really throughout the winter, I like to have a lot of them. All are white in color and most are unscented except for maybe that one that just smell like Christmas. My favorite holiday candle is the Fir & Grapefruit scented one by K. Hall Designs. Not so much a decorating tip but highly important. I find that having my eyes, my nose and my ears all involved in this festive time of year is key. Check out this past post for some of my favorite holiday tunes. For other holiday posts see Christmas Wrapping, Christmas Tree and Advent Calendars. With the holidays quickly approaching, its that time of year again to think about gift giving. In our family, we try to keep our purchases to a minimum. Opting for quality over quantity and items that will hopefully be things that the person will truly value for a long time to come. One thing I love to give is photo gifts. It seems everyone I know is always THINKING about doing something with their photos (album, framing, calendar etc.) but never gets around to it. When approaching a gift of this nature, I usually think super simple and timeless. My thought is you don't want the presentation of the photo to overpower the photo itself. I also tend to shy away from table frames. I find that they can be clutter makers and don't have the same permanency as a wall frame. The only problem with photo gifts is they can require some advance planning and seeing as the holidays seem to pass in a flash, this can sometime be an issue. So this year, I am attempting to think in advance so that I can give the gifts that I really want to give. There a lots of photo production companies out there right now but the one I am gravitating towards is ARTIFACT UPRISING. Their product line is edited, well designed and features some signature items that I really like. Below are a few favorites. This set contains 25 bordered paper prints of 5" x 5" images. The finish is matte (my preferred finish for photo printing) and is priced at $21.99 plus shipping. You also can get a wood block display for your prints which is priced at $23.99 for 12 prints and the block. Layflat photo albums are really in a different category than your standard photo book. They are more like pieces of art (when done well of course). We got one from our wedding photographer and it is one of my most prized possessions. This one starts at $119 and offers the choice between 2 premium papers, 12 fabric cover colors and 4 foil stamping options. These are an investment but so worth it. Two bars of wood connected with magnets creates a flexible display that is more economical than professional framing. Priced at $59, the cleat comes with a 11.5" x 15.5" print that is produced on ultra thick textured matte paper. A simple means of storing your photos and other keepsakes, this 12.5" x 9.5" x 2.5" wooden box is priced at $95. The lid can be customized with a photo print or text and the wood is beetle pine - ideal for maximum print quality and longevity. Since we are hosting Christmas this year, our dining room is going to get a lot of use. We haven't even begun to think about our projects in the room so I am relying/hoping that a beautifully dressed holiday table will go a long way in making the room presentable. My favorite tables are always a mix of styles with natural elements so I am dreaming of something like the examples below.